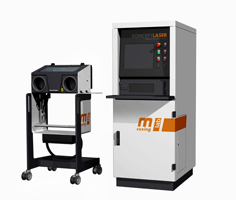 Concept Laser offers it new Mlab cusing R, developed to allow economic fabrication of delicate dental products and medical implants, and for medical instruments made from titanium. The small machines in the Mlab cusing family allow users to start off in the “flyweight class” of additive manufacturing with metals. The new Mlab cusing R now also expands the previous range of materials to include titanium and titanium alloysOne feature is the “drawer principle” with what is known as a glovebox module for safe handling of the material. The patented drawer principle from Concept Laser enables a quick change of material without the risk of any contamination of powder materials. The generative method makes a substantial contribution to improving quality. Cavity formation, rejects and a large amount of reworking, which can arise with the casting method, are now a thing of the past. The Mlab cusing combines a high degree of freedom of geometry, quality and increased material density. Metal laser melting is also a very contemporary method, particularly from the point of view of time: In contrast to the traditional casting method, it offers the advantage that the fully automatic, generative production process can run unattended and overnight. An order can be processed and delivered to the customer the very next day, additive manufacturing with metals means consistently high quality with a short delivery time, and consistent results, time after time.